Marsala, which the Arabs called "Marsa Allah" (i.e. "the port of Allah"), has a very ancient history with its roots in the Phoenician-Punic age. Located on the "Capo Boeo" in western Sicily south of Trapani and between Erice and Selinunte, Marsala is known for its world-class wines, including the classic "Marsala". Your visit to Marsala can start in the Piazza della Repubblica with a visit to the main Church in Marsala, dedicated to Saint Thomas of Canterbury and with a baroque style façade - it is of Norman origin but has been rebuilt over the centuries. The church façade is decorated with statues and flanked by two bell towers, while the interior has three naves and a number of 16th century sculptures, among them the "Madonna of the People" by Domenico Gagini (1420-1492). The Old Town in Marsala is part of the so-called "Cassaro", an area once enclosed by walls, some of which remain and date back to the time of Spanish rule. Among the most significant monuments of the city is the 12th century Monastery of the Annunziata dei Carmelitani. 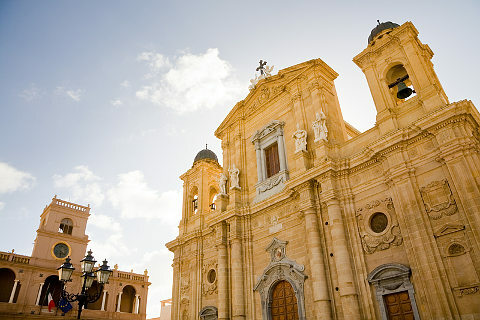 The bell tower of the Carmine church was built in the 16th century and rebuilt in the 18th by Giovanni Biagio Amico, royal architect of Trapani, who retained the original structure and the old proportions. The bell tower is very famous for its spiral staircase in yellow tuff. The monastery annexed to the Church probably dates from the 14th century and is rich in frescoes and the church has both renaissance and baroque style motifs. Behind the Cathedral Church you can also visit the Tapestry Museum, which houses some 16th century Flemish tapestries depicting scenes from the Bible. Be sure to visit the 16th century Church of St. John which is well known for its underground vaults where there is a spring, the "Cave of the Sibyl.” The cave consists of a central hall, circular in shape and connected with two other rooms. The central room, carved into the rock, is covered by a low dome and holds a square basin full of water. In front of the cave is a large stone altar with a marble statue of Saint John the Baptist, dating from the 15th century. An important museum in Marsala is the Archaeological Museum, which houses interesting prehistoric finds from Marsala and the surrounding area - and the remains of a Punic ship. The wreck, of which part of the stern and the port side are preserved, was originally about 30m long and 4m wide. There is also a large jar of fruit found in Mozia (Mothya) which, according to critics, dates back the so-called "culture of Thapsos", and various stone tools of the Upper Paleolithic era. There are also various objects from the Phoenician age including a funerary urn and a pair of jewels. Other items include a 3rd century BC bronze mirror, funerary slaps from the 4-3rd century BC and some important floor mosaics from the 5th century. As well as the old town and the museum many visitors are attracted by the long sandy beaches and the easy access to the Aegadian Islands of Favignana and Levanzo. Outside the city there are two important archaeological sites: the excavations of the ancient Lylibaeum and of the so-called "Insula Romana", and those of Mozia, on the island of San Pantaleo. At Lylibaeum in the area of Capo Boeo the remains of many houses were found in 1939, of which the most important is the so-called insula*, dating back to the 2nd - 1st century BC. Next to the insula a domus* was found which has a tessellated floor, atrium, peristyle and thermae. * The Latin term "insula" designated adjacent houses, a sort of ancient Roman apartment complex, whose residents were known as insularii. A "domus" was the private residence for citizens of high rank. Other buildings here date from the Imperial Age, and were abandoned in the 4th century AD because of an earthquake and invasion by the Vandals. The ancient Punic and Medieval fortifications at Lylibaeum are particularly interesting, and show that the city was almost impregnable. During the Punic age there was a wide moat next to the wall - the moat and the walls probably date from the 4th century BC. The medieval castle of Marsala stood at the point where the Punic ditch formed a right angle and had a courtyard with three square towers and one circular tower. The castle of Marsala is presumed to be of Norman origin, although it was restored by Frederick II of Swabia [1194-1250). The necropolis of the ancient city, dating from the 4th century BC, presents various archaeological finds. These include a number of "stelae" (carved stone slabs) one of which is dedicated to the god Ba'al Hammon and bears various symbols relating to Punic religion. Another group of stelae, dating from the 1-2nd century AD and in the shape of a small building with columns and pillars, are made of limestone and covered with a thick layer of white plaster on which banquet scenes, flowers, Greek inscriptions and the symbol of the god Tanit are painted in bright colors. Among the Phoenician-Punic cities of Sicily, Mozia contains many important archaeological finds, such as the so-called "Tophet", where, according to tradition, the Phoenicians practiced the sacrifice of children. Several stelae have also been found in Mozia, which together form a unique range of Phoenician-Punic sculpture. Interestingly the icons used are derived from various subjects used in the Syro-Palestinian area and the Middle East. Note that the island of San Pantaleo is also part of a nature trail known as the “Laguna dello Stagnone”, in which you can see the salt-works and old mills. For wine lovers and gourmets we recommend a visit to the wineries of Marsala, and a tasting of some local specialities such as couscous, which originated from the Arab cuisine, the "eggplant caponata”, "carpaccio of swordfish," "Sicilian Cassata," and finally "pasta alla Norma" and "pasta with sardines." See also Marsala history and etymology. 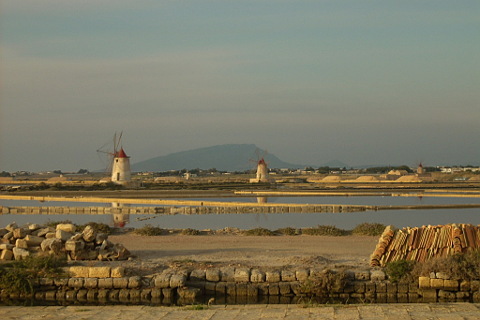 The Salt Works Natural Reserve can be entered from Marsala and from Paceco and Trapani. 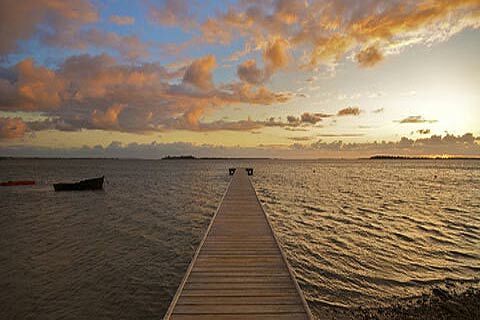 It is a large area of salt flats which are home to many species of birds. The area is still used to produce salt using traditional methods - and the ancient windmills that dot the landscape. You can visit a Salt Museum to see how the salt extraction takes place. Both the seafront and old town of Mazara del Vallo are popular with visitors. With pretty streets and harbour Mazara del Vallo has plenty to explore. Visit the splendid hilltop town of Erice with its ancient walls, castle and churches.